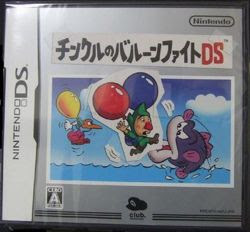 Now here's a game that I've been keeping my beady little eyes on for some time: Tingle's Balloon Fight. Not because it's an amazingly crafted title, but because it's pretty darn rare and oh, so Japanese. Well, it seems the editors at IGN.com have gotten their hands on the game (only available to members of the Japanese Club Nintendo) and recently shared their impressions of it. Writer Anoop Gantayat's verdict? "I enjoyed playing a few rounds of this latest Club Nintendo bonus item," he says. "However, I'm not sure if it offers enough gameplay to warrant a purchase through an auction site, unless you're a collector." Want to see the game in action? Check out this wacky YouTube video from Japan. Too bad Nintendo doesn't seem interested in bringing the game to the U.S. in any form or fashion. Personally, I think it would be cool to either offer this alongside Tingle RPG (if it's ever released on this side of the pond) or offer it as some sort of premium download for those who pick up the sure-to-be-niche game.